It’s been a while since we have had a Shibuya Streets series. The weekends are always busy with foot traffic and with a spare hour, I took a walk out to test my a new camera. Some of the shots I was very pleased with, others got to test out the ‘delete’ button function. The delete function is probably the one I have best mastered now with this camera. Here are the shots with some brief comments to give you a feel for Shibuya from the street. This one was by mistake, but since this is 'Shibuya Streets', why not? I remember traveling to New York some years ago and being surprised at how different the street fashions and street manners were to a comparable big city like Tokyo. It never gets boring watching the movement of the city. After all those trucks, it’s nice to see the Hachiko small community bus get a chance to hit the road. That’s a quick round up for this version of Shibuya Streets. There is always a lot of activity in Shibuya, particularly around the crossing. The fashions and the movements of people are fascinating to watch. It has been a while since the last Shibuya streets walk. This post goes along with your last article about Shibuya then and now. And it sure is a popular area, I guess just like Akihabara; the fashion,music,people,and places to visit. Danny Choo did a tour of Shibuya at night, it can be found on You Tube and it was quite as colorful at night as is during the day. The one thing that I noticed during that video is that I saw a soccer match going on at the top of a building at night. would you happen to know where it's located? All the different ways to advertise, very colorful and informative, even a Hachiko bus how cool to advertise for your area. Another great article and photo series as usual keep up the great work, I always enjoy going to your site. You can get a good view of the Futsal Park from the Excel Tokyu Hotel. I used to stay there sometimes if I had guests from O/S. I will go back and get some better photos of this one evening. Looking down on the crossing and the Futsal Park is pretty cool. My friends and I are planning to go to Japan next year. Thanks for sharing some pics of Shibuya. 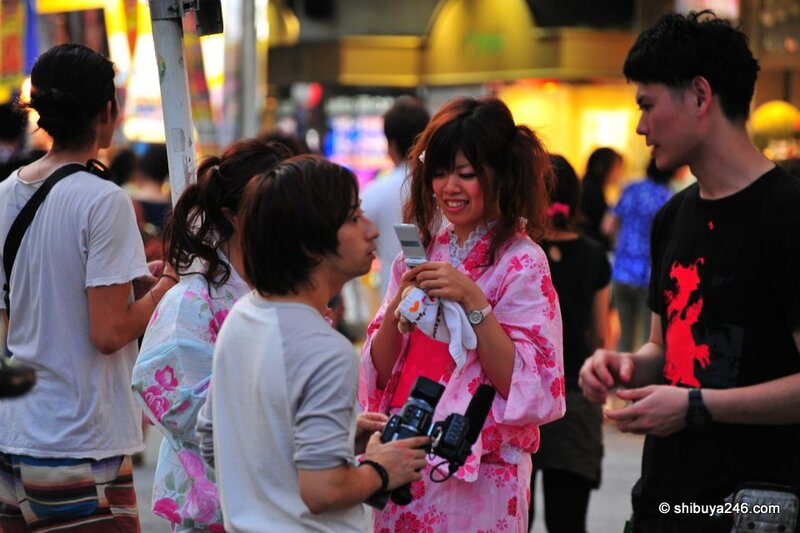 We’d love to cross the streets of Shibuya and take some pictures too. oh sorry, can I borrow the pic of Jun’s add and the Hachiko bus. Thanks! Nice photos. And big! You make Japan look amazing. As someone who also lives here too, I like what you’re doing.